Graphics IT was established in April 1999 and over the past 10 years we've worked on a wide variety of Graphic Design and Web Development Projects with Agencies, Government Departments and Private clients. We're rolling out some exciting new initiatives including an integrated digital & marketing strategy which is bundled within our very own WCM system - Colab. Striking graphics, meticulous attention to detail and strict development standards are promised as we work with you to create compelling, useable and user focused sites to delight that impatient bunch known as web users. We'll continue to create graphics that deliver your message in the most engaging and relevant way. Whether it is finding your way on a map, remembering the name and number on a business card or directing a user to the 'Buy' button on your website we've got 10 years experience and plenty of plaudits. 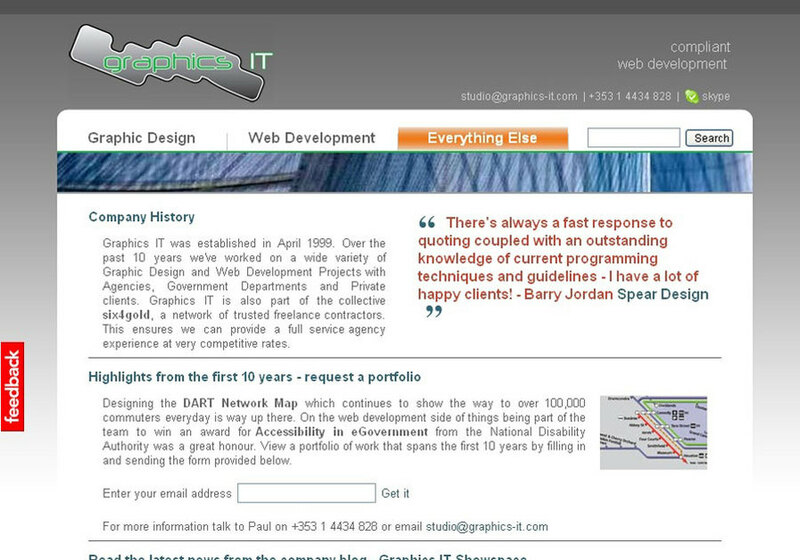 Graphics IT is an established full service Graphic Design and Web Development Studio. This is a screenshot of the company home page and includes a company overview, the email address studio@graphics-it.com and phone number +353 1 4434 828.